Allow everyone a space to be heard, in an area dedicated to informal communication. Share messages of kindness, gentle reminders or say thank you. Demonstrate how little things can make a difference in your workplace. 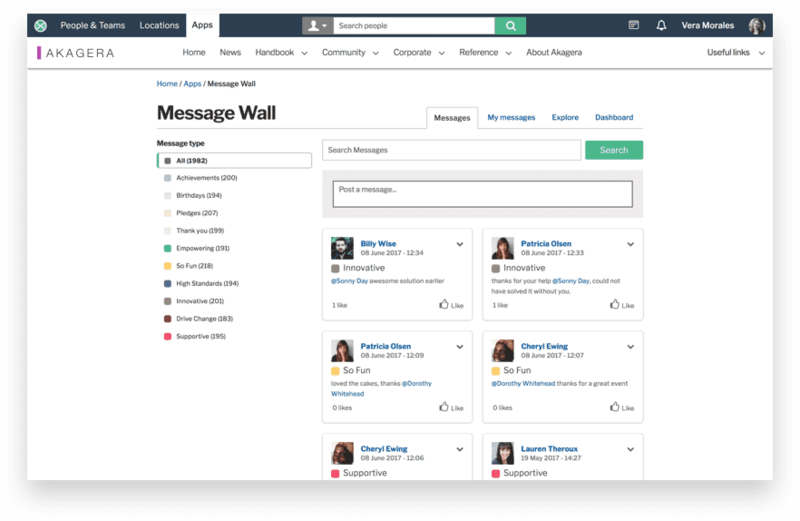 Receive notifications if you are mentioned in a message, and view the levels of engagement on the Message Wall dashboard. Share micro-news updates with your colleagues using Invotra Message Wall. Immediate, simple, exciting communication across your organisation, breaking down silos and reinforcing values. Categorise your messages using company values or important company subjects, @mention individuals to immediately notify them, hashtag to quickly create memes for others to follow. Join our existing clients in using this tool to create an exciting informal, collaborative intranet and portal. 1. Post quick messages to colleagues and use @mentioning to notify colleagues of your message. 2. Like, rate and comment on messages, and add hashtags and @mentioning within messages. 3. Messages can be moderated, before or after they are posted on the Wall. 4. Messages are categorised, with organisations able to choose the type of messages they wish users to post. 5. 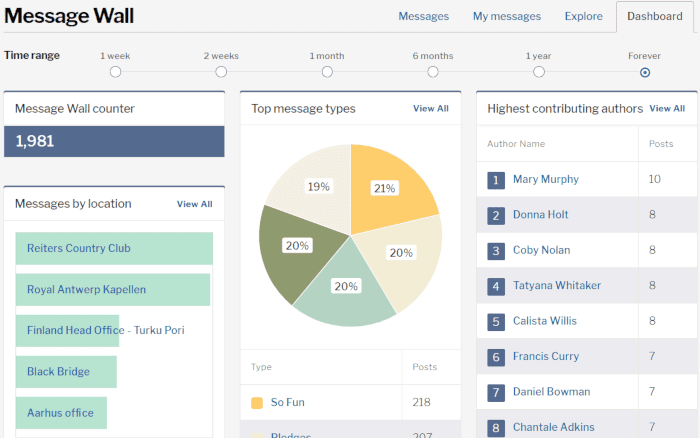 Dashboards allow users to see the most popular message type, best contributors and most mentioned users and hashtags.